General Motors and Canadian union Unifor remain far apart in settling a strike over job security that has idled Chevrolet Equinox output at an Ontario plant since Sept. 17. Unifor National President Jerry Dias updated factory workers on the status of negotiations when he joined a picket line Sunday in Ingersoll, Ont. 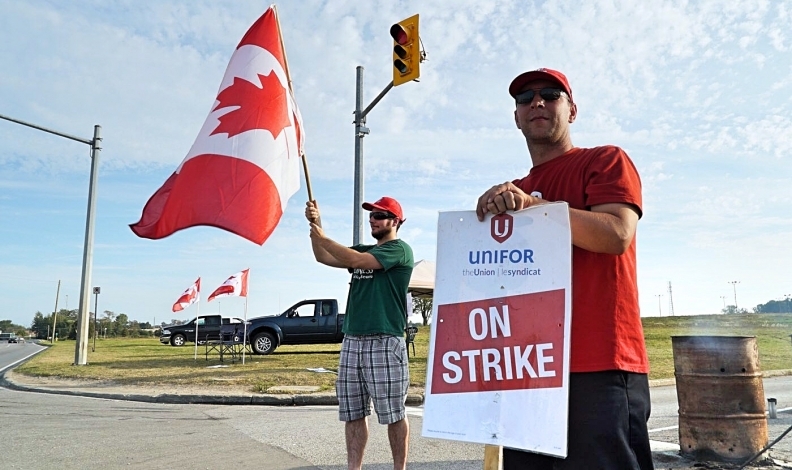 “I told striking Unifor Local 88 this is about the survival of the community. Everything we are fighting for they have earned,” Dias said in a Twitter post Sunday. A team of negotiators from Unifor Local 88 met with GM officials on Thursday in Detroit to discuss job security. The union said the Detroit meeting at GM's headquarters included the heads of the company's North American manufacturing and finance operations. Unifor wants a commitment from GM that the CAMI factory will remain the lead producer of the Chevy Equinox. The crossover is also assembled in Mexico. "We expressed our concerns around our outstanding issues, such as job security, economics and contract language," the union said in the blog posting. GM shifted production of the GMC Terrain crossover from the Ingersoll plant to Mexico in July, resulting in 400 job cuts.